The Internet is like an ecosystem. All the different sites, content, and users while unique, tend to feed off one another. A good example of this is affiliate marketing where advertisers and publishers enjoy a mutually beneficial relationship: Publishers earn money promoting products and advertisers make sales they may have otherwise missed out on. Sounds like a win-win, right? It can be — when done right. But perhaps, I’m getting a little bit ahead of myself. Let’s start from the beginning, shall we? About five months ago, I finally started focusing on affiliate marketing as a way to monetize Work from Home Happiness. Up until that point, I had almost exclusively been focused on building an audience, growing traffic, and developing longform content. And, while slow going, this plan was working — for traffic, anyway. In terms of monetization, not so much, or not as much as I would have liked. So, feeling pretty good in my overall content marketing strategy, I knew it was time to jump into affiliate marketing. And, as a total beginner, this is what I learned and what I did to reach a point where I’m making $2,500/month (and growing!) in affiliate sales alone. Some advertisers will pay you for every “click” you send their way. That is, every time someone clicks on your affiliate link you receive payment, no matter what that person does next. For example, I’m an affiliate with the BookScouter App. They pay $0.15 for every click I send their way. It doesn’t matter if the person downloads the app or simply exits takes a look around and then leaves the site — I still get $0.15. As a pay per click affiliate, you’ll receive a flat rate (like the $0.15 I mentioned) for every click your referral link receives. So, the more traffic you have, the greater your chances are of getting people to click through using your link. With pay per lead programs, you’ll receive a set payout for each lead you send over to a company. This requires the ‘lead’ to click on your affiliate link and then perform some task, say fill out a form, request information or some other action as defined in your affiliate agreement. For example, I’m an affiliate with Chloe+Isabel. It’s a company that helps women set up their own online jewelry business. Whenever someone clicks on my affiliate link and then applies to become a merchandiser with Chloe+Isabel, I receive $40. See the difference? If someone simply clicks on my affiliate link, checks out the site and moves on, I don’t receive anything. But if they apply to become a merchandiser after clicking my affiliate link, I receive a commission for that lead. Pay per sale affiliate programs give you a percentage of a purchase. So, this means someone needs to click your affiliate link, visit a website, and then make a purchase. You’ll receive a pre-determined percentage of each sale you refer. The amount you’ll receive varies — it could be 10% or 60% — it really just depends on the affiliate program’s terms. For example, I’m an affiliate with an online transcription course called TranscribeAnywhere. I receive 20% commission each time someone signs up for the course using my affiliate link. While most pay per sale affiliate programs pay you a percentage of each sale you refer, some will pay you a flat rate. For example, BlueHost pays their affiliates between $65-$75 for each new hosting customer they send over — regardless of what kind of hosting plan the referral signs up for. What Makes Affiliate Marketing So Great, Anyway? Another great question! And, really, exactly what I was thinking five months back too. Up until that point, I had put very little effort into my affiliate marketing strategy. Sure, I had signed up as a publisher for a few products and placed some links throughout my site, but didn’t come up with an affiliate marketing plan like I had done when creating a content marketing strategy. And, as a result, my affiliate sales were lacking — next to nothing, in fact. That’s why I never understood why so many people were declaring affiliate marketing as the way to monetize a blog or website. But then I decided it was time to get serious about monetizing Work from Home Happiness. I had worked hard to create traffic — it was time to build up my income too. Enter affiliate marketing. And I quickly fell in love with this way of earning for a few reasons. When you decide to monetize your blog or website with affiliate links, you can literally make money from anywhere with an Internet connection. As an affiliate marketer, you’re not tethered to a particular location or limited in how much you earn — you’ll get out of it what you put into it. The great thing about promoting other people’s products is you’re not creating them yourself. Now, don’t get me wrong, creating your own information products is a great way to earn — but there’s also something to be said about forgoing creating in favor of promoting 🙂 You don’t have any of the customer service to deal with — just sit back and watch your affiliate sales roll in. There’s few greater feelings than waking up in the morning only to find you made $100 while you slept. And this isn’t unusual as an affiliate marketer. In fact, a well-written blog post that took a few hours to write, could wind up being one of your biggest money makers each month. And the best part is, it’s all passive income! Unlike a brick and mortar business, starting a blog or website costs next to nothing. And maintaining your site is equally cheap. So, when you add affiliate marketing into the mix, you have the potential to earn hundreds of thousands of dollars each month for something that costs just a few bucks to maintain. It doesn’t matter what your niche is, affiliate marketing can easily complement your existing content. I can attest to this — since I spent the majority of my first year as a blogger building my traffic and creating longform content, I was nervous how I could monetize hundreds of existing blog posts and dozens of pages. Turns out, it wasn’t a problem at all. In fact, it was super simple to go back and add affiliate links to blog posts a year old, turning work I had already done into recurring revenue streams. What’s not to love? As with anything, affiliate marketing isn’t just a long list of pros. There’s some cons you should be aware of too. And I think it’s important to discuss these. I’m not trying to rain on your affiliate marketing parade. Instead, I’d rather you be realistic about the possibilities of getting started and what to expect in the beginning. Don’t expect same day payouts whenever you make a referral. In fact, once you make a referral, it can take anywhere from 30 to 60 days before you’re paid. Once you get going, you’ll receive payments in regular intervals — but in the beginning, it can feel like forever before you receive a payment. You can’t really rely on affiliate marketing as a revenue stream. Sure, you may be able to project what you’ll make each month but this can be hit or miss. You could have one month that is super amazing only to be followed up by a fraction of that the next month. Now you know the pros and cons of affiliate marketing, and you still want to jump in. Great! But before you do, know this: Not all affiliate networks are created equal. Before signing up for a program there are some things to consider. And the more thought you put into it ahead of time, the more you’ll get out of it in the long run. Fact: I made the mistake of signing up for just about every affiliate marketing program and network under the sun. My reason? The more I promoted, the more I’d earn. Right? Right?!?! Wrong. Turns out, this was ineffective. For one, I forgot I was even a part of 90% of the programs I signed up for. And two, one link placed in one blog post does not an affiliate strategy make. Instead, it’s best to focus on a few programs — and promote them over and over again on your blog and social media. Even though you’re promoting fewer things, you’ll earn more because you’re focusing your efforts on a handful of products that actually produce results. Seriously. Just don’t do it. In my foolish quest to sign up for almost every affiliate program, I came across several that promised everything but the moon — and, as luck would have it, these programs would always be on special — normally $99 but promo priced at $20. Granted, I just made up that scenario but you get the point. You don’t need to pay to be an affiliate. As a beginner, it may be tempting to pay for these programs that swear they will give you the keys to affiliate marketing success and quickly earn you six figures a month — but stick to your guns and move on. You’d probably be pretty confused if I promoted clothing and accessories here on Work from Home Happiness — and for good reason. I blog about remote careers, online entrepreneurship, and freelancing. Fashion just doesn’t fit in. And your readers will be equally confused if you step outside of your niche to promote unrelated products. Not only will this confusion lead them to not purchase what you’re selling, but it may turn them off from your blog altogether. Remember, an affiliate product should perfectly complement you, your blog and your content — not confuse people. This may seem like an obvious answer but, the truth is, it really isn’t. Obviously, you want to monetize your website or blog with affiliate links but how you go about it and where you place them will make all the difference in your sales. Plus, if you have a strong social presence, there’s the option of placing affiliate links on social sites. I cringe when I read back over my first not-so-subtle attempts at affiliate marketing. Blog posts that I revamped to include affiliate links went from casual reads to gross sales pitches faster than you could hit the X on your browser. This is another place to remind you that less is more. Yes, it’s a good idea to go back through older posts and refresh them. And if you find one where it makes sense to include an affiliate link or two — go for it. But don’t overdo it. You look like you’re spamming your own blog posts and readers probably won’t buy what you’re selling anyway. Keep yourself to two or three affiliate links per post — one in the beginning, one in the middle, and one at the end. That’s it. Your site’s sidebar can really do wonders for your affiliate sales. And, no, this doesn’t mean filling your sidebar with tons of skyscraper ads and 300×250 squares promoting anything and everything. Instead, pick one affiliate offer and create a custom ad for it, one that fits your overall look/design/feel/colors. I like to use Canva for this, but you can use any program you like. 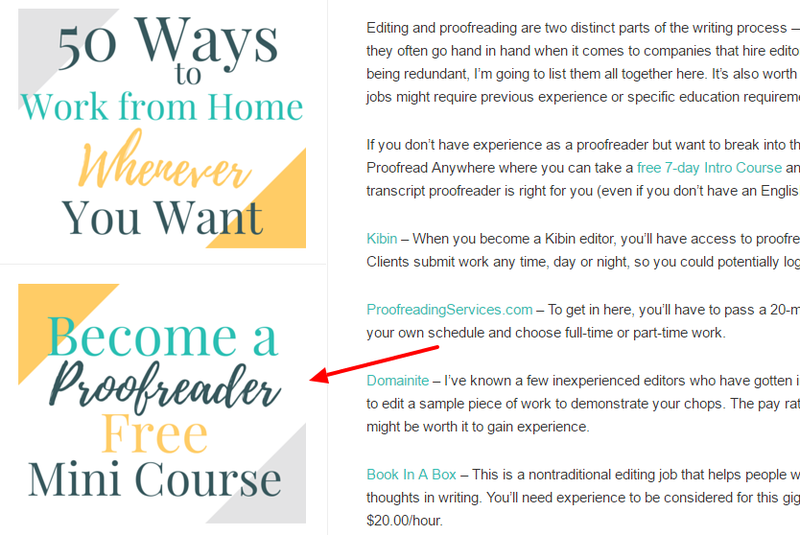 Check out this one I made for ProofreadAnywhere — it converts better than any text links I use throughout various pages and posts! As I previously mentioned, many of your social profiles can be monetized with affiliate links. Twitter, Facebook, Instagram, and Pinterest all allow affiliate links within your daily posts, pins, pictures, and tweets. This is an area I’m just now getting int0 — but I’ve already found that, when done right, a well placed affiliate link can be really effective on social media — especially Pinterest. Again, I like to use Canva to create a custom pin for an affiliate offer. 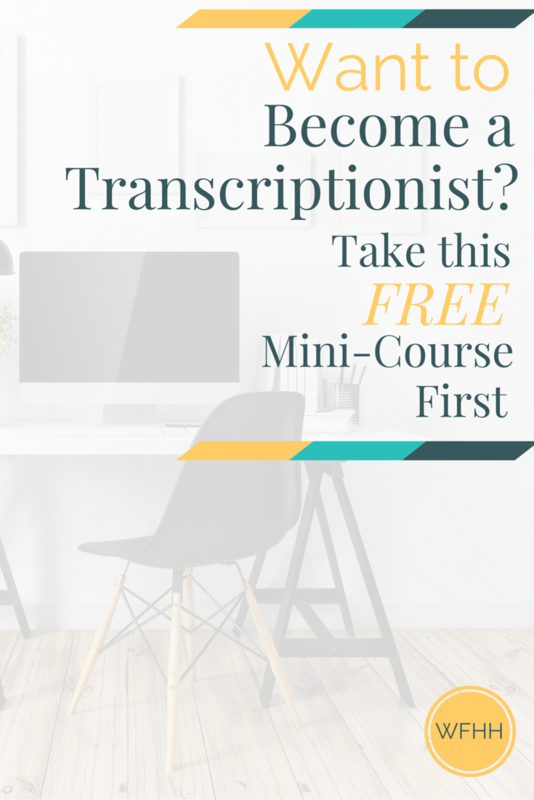 For example, I created this pin for Transcribe Anywhere’s free mini course — if someone clicks on this pin, takes the freebie course, and then later signs up for the paid course, I’ll get a commission — thanks to a well-placed pin. But, again, this is a case of less is more — don’t only pin affiliate offers, send out tweets with affiliate links, or use Facebook non-stop to display affiliate programs. You’ll turn off your social followers and likely won’t receive any affiliate sales. If you have subscribers, there’s another potential outlet to earn money — even if you don’t have your own digital products to sell yet. Again, promoting affiliate offers to your email list should be done only when appropriate and relevant to your niche. If someone trusts you enough to offer up their email to you, don’t lose their trust by constantly sending them affiliate offers — you’ll likely lose subscribers and come off as spammy. When you plan on using affiliate links as a way to monetize your site, remember this: Content is key! A well written post that just happens to contain an affiliate link or two will convert much better than a post thrown up for the sake of trying to make a buck or two. Remember, you always want to be providing value to your readers — even when promoting affiliate programs. And offering value usually starts with amazing content that people actually want to read and share. Noticing a theme? Whether you promote to your email list, on social media, your blog’s sidebar, or posts, use your affiliate links sparingly! The more you use in one spot the more it will feel like a spam-filled zone. While the point of affiliate marketing is to make money, overdoing it can actually backfire. You don’t want to be a rule breaker when it comes to affiliate marketing. At the very least, it can get you kicked out of an affiliate program. And the worst, it can land you in hot water with the Federal Trade Commission (FTC). There are specific rules bloggers must follow when making endorsements — and this includes disclosing any advertiser-publisher relationships to your readers. That’s why most bloggers have a disclosure statement page and include reference to it in any blog posts with affiliate links. Make sure you read the FTC’s Endorsement Policy as well as understand the dos and don’ts of the individual affiliate programs you’re a part of! Affiliate links aren’t very pretty — but that’s for good reason. These long, complicated looking links are used to track publisher sales. Without them, you wouldn’t get credit every time you made a referral. But people may hesitate to click on these super long affiliate links because they aren’t easily recognized. If you’re a WordPress user, this is an easy fix. You can use a simple and free plugin like Pretty Links Lite. This will take your links from long and scary looking to short and familiar. The picture to the right there is a screenshot of some of my affiliate links that have been transformed thanks to Pretty Links Lite. 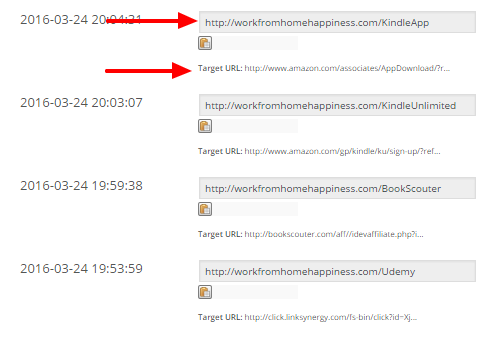 The target URLs are the original links you receive when you sign up for an affiliate program. As you can see, they aren’t the most attractive. But Pretty Links solves this by allowing you to create much shorter and branded affiliate links as seen in the grey boxes. People are more likely to click on your branded links than they are some unknown one. Note, it’s fine to use these shortened and beautified links on your own blog but some sites won’t let you use them. For example, while Pinterest allows affiliate links, they will not let you use so-called “link cloakers” to promote products. You’ve got to use the original link! I am by no means an affiliate marketing expert. But I’m learning a lot — just like you. And I’m eager to share what I’ve learned so far. 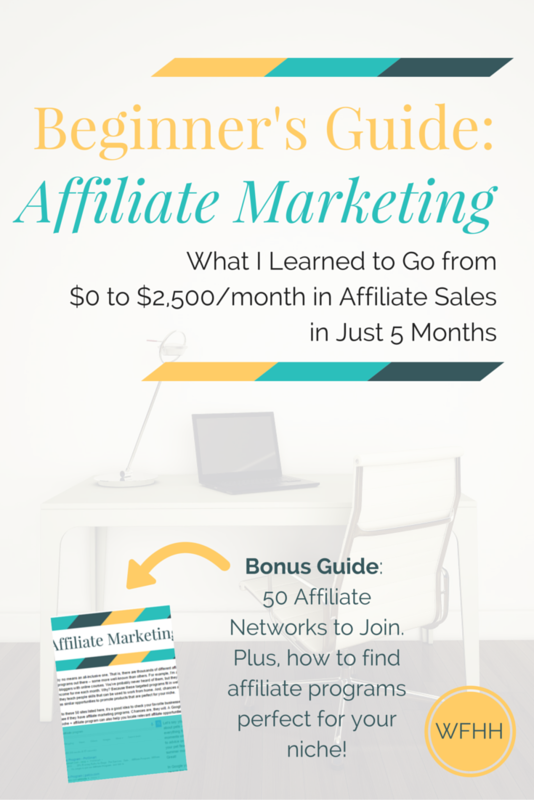 Part of the reason it took me a while to get a grasp on affiliate marketing was because I knew very little — and a lot of the information was intimidating and overwhelming! The advertiser is the person or company who has created a product or service for sale. You’ll be promoting the advertiser’s items for them. In affiliate marketing, the advertiser is often referred to as the merchant. When you agree to promote an advertiser’s products or services and receive pay based on performance, you’re officially an affiliate. Remember, as an affiliate you can get paid per click, per lead, or per sale. Your affiliate agreement will determine the terms of your affiliate relationship with an advertiser. Your affiliate link is unique to you. It’s used to direct potential customers to the advertiser’s website. When a person clicks on your affiliate link, performs an action, or makes a purchase, you’ll be given credit for it. Remember, you can use a plugin, like Pretty Links, to make your affiliate links more attractive. An affiliate network brings together advertisers and publishers. It’s essentially a marketplace of advertisers who are looking for publishers to promote their products and services. When you sign up at an affiliate network, you’re often paid by the network and not directly from the advertiser. An affiliate program is a single platform ran by the advertiser to keep track of publisher sales. It’s usually a place you can login to to see your affiliate statistics. A click through simply refers to someone who clicks on your affiliate link and is then redirected to the advertiser’s site. The payout you receive for getting someone to click on your affiliate link, perform an action, or make a purchase is called a commission. A commission can be a flat rate or percentage of sale — it depends on the terms of the affiliate program. A conversion rate is the number of affiliate link clicks that actually turn into a lead or sale for which you’re paid a commission. Let’s pretend 100 people click on your affiliate link and 90 of them leave the advertiser’s website without doing anything but the other 10 make a purchase — your conversion rate would be 10%. When someone clicks your affiliate link, a ‘cookie’ is assigned to that person to identify them as your referral. If they end up converting at a later date, you could potentially earn a commission. Let’s say an affiliate program you’re a part of has 60-day cookies. This means that you could receive a commission if a person makes a purchase within that 60-day window from when they first clicked on your affiliate link. You’re the publisher! As the person placing affiliate links on your blog or website, you’re considered the publisher since you’re “publishing” promotional links. Ready to sign up for programs and start promoting and earning? I’ve got you covered! Sign up to the Free Resource Library below. There you’ll find tons of valuable freebies for out-of-the-cube thinkers, like you, including my list of 50 Affiliate Marketing Networks to join. There’s even helpful hints for finding the perfect niche programs and products that make sense for your unique blog and brand. Questions? Hit me with them! I’m learning right alongside with you. If I don’t know, I’m happy to ask someone who will: ashlee@workfromhomehappiness.com or say hi on Twitter — I can be found under the handle AshleeWrites. Awesome post with so many actionable things!! I have not read any post recently which explains Affiliate Marketing so well. Surely bookmarked it for my affiliate strategy. I will surely have many questions for you when I start. Many thanks Ashlee! You’ve actually explained “Affiliate Marketing” in the simplest way possible. How do you pin aa picture for an affiliate link and have it be directed to your affiliate link? I’m not pin-savvy enough to understand that I don’t think haha. What ‘they’ said! Though I have a little experience with it, I have a business partner who does most of the dealing with that aspect. This article really helped clear things up, for experienced and inexperienced affiliates alike. Thank you so much for this. I’ve been researching for hours trying to figure out how it all works without having to pay for the information. So happy I found your post! You rock! Thanks Ashlee. This is very, very helpful.